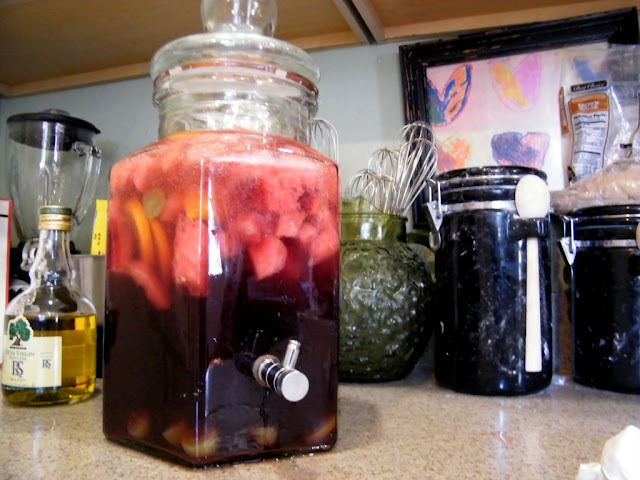 Inspired by the images on this post and then by the recipe linked up on this one, last week I used a one dollar garage sale find and a recipe altered for non drinkers to serve my pretend sister some fake sangria. Convoluted enough yet? Use a gallon sized glass container if you have one, and make sure it fits inside your fridge. And make sure you have non linty towels to clean up the sticky mess you will find in your fridge if it turns out that your dispenser leaks. Like mine. Also, mix this several hours in advance, even the night before if you can. We discovered it tastes even better on day two, perhaps needing only fresh bubbly stuff poured in for volume. The fruitiness gained in concentration, so I doubt you’d have to worry about diluting the flavor. 1 bottle of a good, tangy fruit juice, NOT fruit juice cocktail. Choose a 100% juice, no sugar added. This punch will be plenty sweet enough already. I think I bought cranberry-pomegranate. Remainder of 2-liter bottle of Fresca. Stir it all together, seal it up so no fridge secrets distort the flavor, and enjoy it in a few hours. Even the kiddos liked it, and it was guiltless, being almost free of refined sugar and LOADED with fresh vitamins. The next day I had short, handsome guests who were happy to eat some of the marinated fruit! This morning, the Tuesday following a wonderfully restful Memorial Day weekend, Handsome and I are enjoying a bonus day off together, albeit mildly perforated with some loose-end tying up, etc. We stayed in bed much longer than normal then lingered even longer watching recorded episodes of Gordon Ramsey, the vicious but passionate T.V. chef who reinvigorates privately owned restaurants in a week. We love this show. Anyway, it usually gets us in the mood for meals a little elevated from our daily fare. This, combined with the bonus day off together, meant crepes for brunch! Had I stopped cooking long enough to take a photo of the syrup making process, you could right now be gazing at its rich, amber color and glassiness. Instead, you should just make your own as soon as possible. It is super easy and so worth the small pantry expense. Grab a good looking wooden spoon to whisk and stir the mixture as it boils and reduces and boils more. Once it is heated to a consistently stirrable thinness and is a uniform color of gold, just remove the stock pot from heat and wait maybe a minute to pour the liquid gold into a heatproof glass measuring bowl. I started serving it immediately, before checking the measurement, so am not sure of the exact yield. But let’s say it was a little under 2 cups. And this is so rich and flavorful that a very small amount more than sweetens a plate of crepes! So consider doing this next time you have company for brunch. One batch should make its way around the table nicely, and you will be collecting compliments till the coffee is cold.